Okay, I need to stop before I talk myself back into them. Sadly, I had to ax this idea because I don’t have a house-shaped cookie cutter and I can’t justify driving all the way back to my favorite little bakery store in the city to get one. That, and, I’m still surrounded by boxes that need unpacking. And did I mention people are coming this weekend? So, no cookies. But I still wanted to do something that was a little bit special, but not super time consuming, so I decided on a hot cocoa bar. I also wanted to make a little treat to go with the chocolatey hot drinks and then it hit me – what about a treat that could go IN the drinks?! 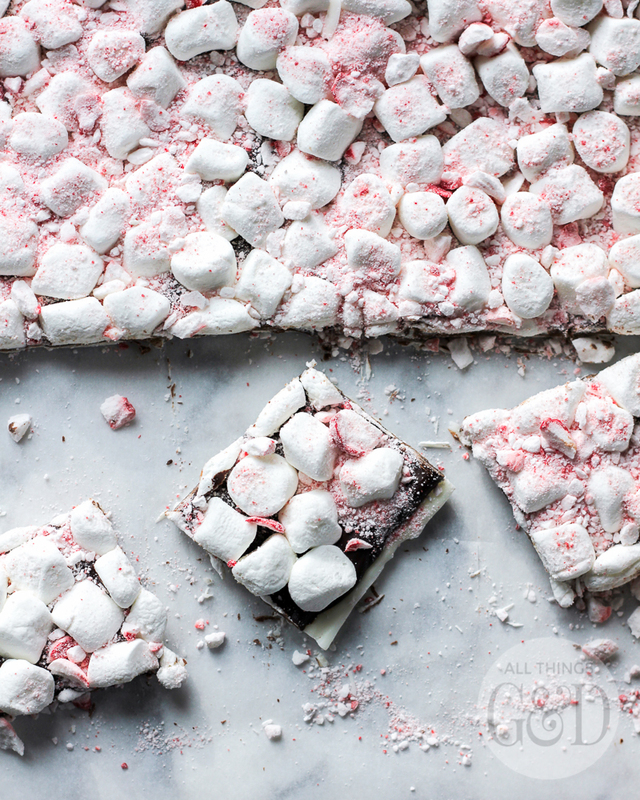 Nothing goes better with hot cocoa than marshmallows, but peppermint is a close second. 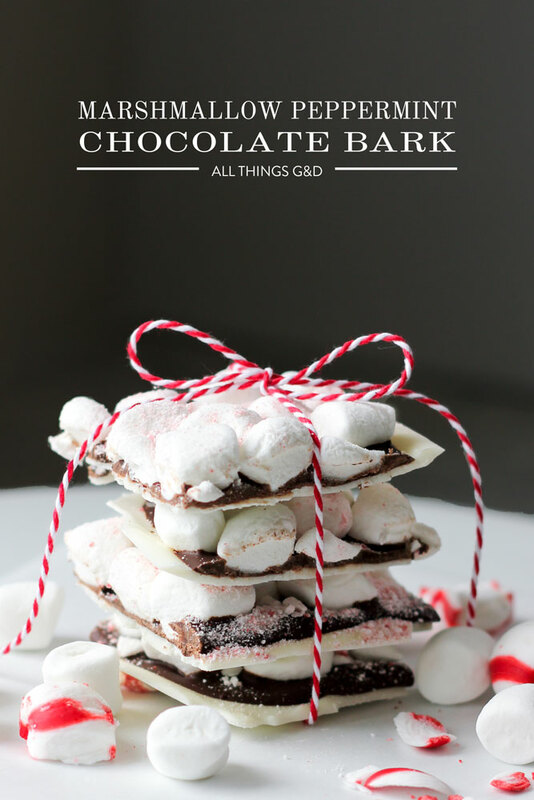 To make this idea come to life I grabbed my favorite hot cocoa ingredients and used them to create a quick-melting chocolate bark that you can stir right into your cup of cocoa to flavor it. I tested it out as soon as the first batch was set and it was the best cup of cocoa I’d ever tasted. Why haven’t I ever thought of this before?? All of those boring wasted cups of hot cocoa. Such a pity. Cover a large cookie sheet with parchment paper. Melt white chocolate chips according to package directions. Once the chips are melted, stir in 4 drops of Young Living Peppermint essential oil. Place cookie sheet in the refrigerator or freezer until the white chocolate has hardened (about 15-20 minutes). Melt semi-sweet chocolate chips according to package directions. Once the chips are melted, stir in 4 drops of Young Living Peppermint essential oil. 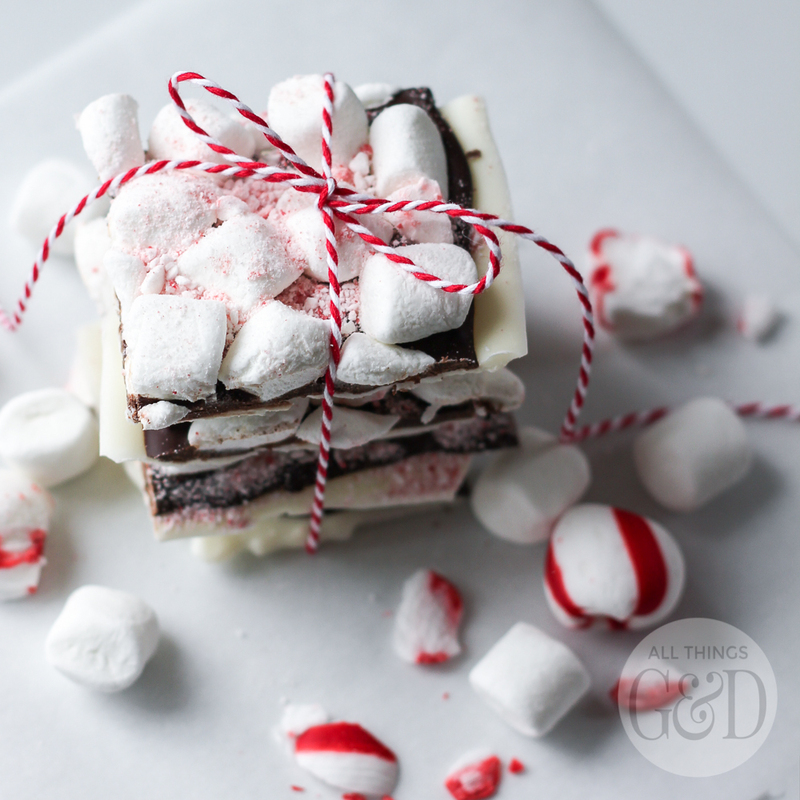 Evenly spread the semi-sweet chocolate peppermint mixture over the top of your white chocolate rectangle, spreading it out to the edges. Working quickly before your chocolate sets, sprinkle miniature marshmallows onto the top of your semi-sweet chocolate layer, using as little or as many marshmallows as you’d like. (I used a lot.) Gently press down on the marshmallows with the palm of your hand to get them nestled into the chocolate. Once all of your marshmallows are on and pressed in, sprinkle the crushed soft mint candies over the top. Return cookie sheet to the refrigerator (or freezer) until the top layer of chocolate has hardened (about 15-20 minutes). Once the entire mixture is set/hardened, cut it into squares and serve or store in an airtight container. 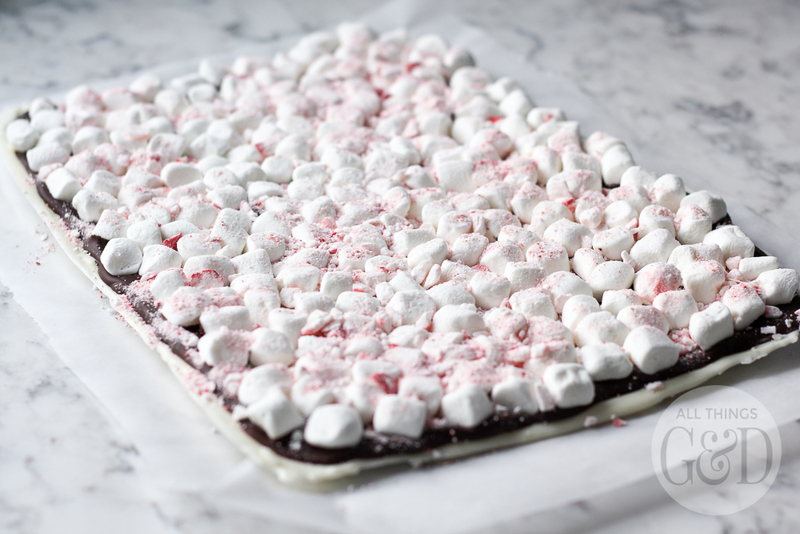 A slab of Marshmallow Peppermint Bark before cutting. 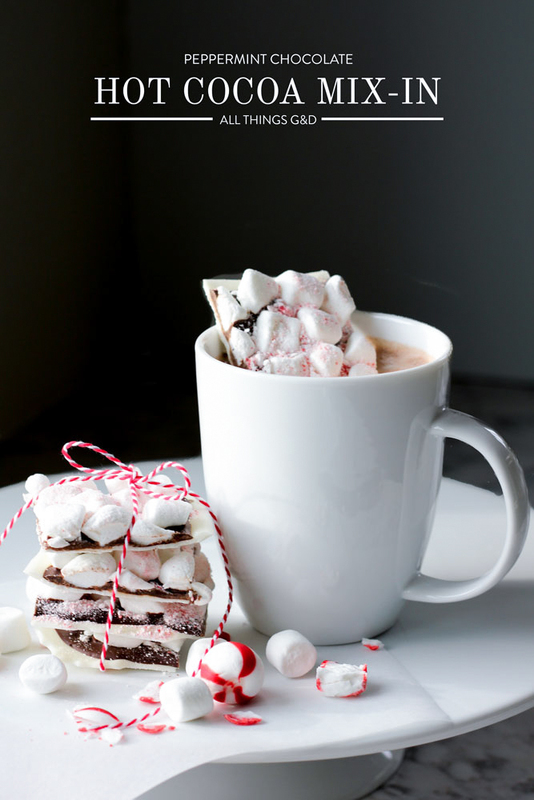 To use this marshmallow peppermint bark as a hot cocoa mix-in, simply drop a square into a freshly brewed cup of hot cocoa, stir, and enjoy! 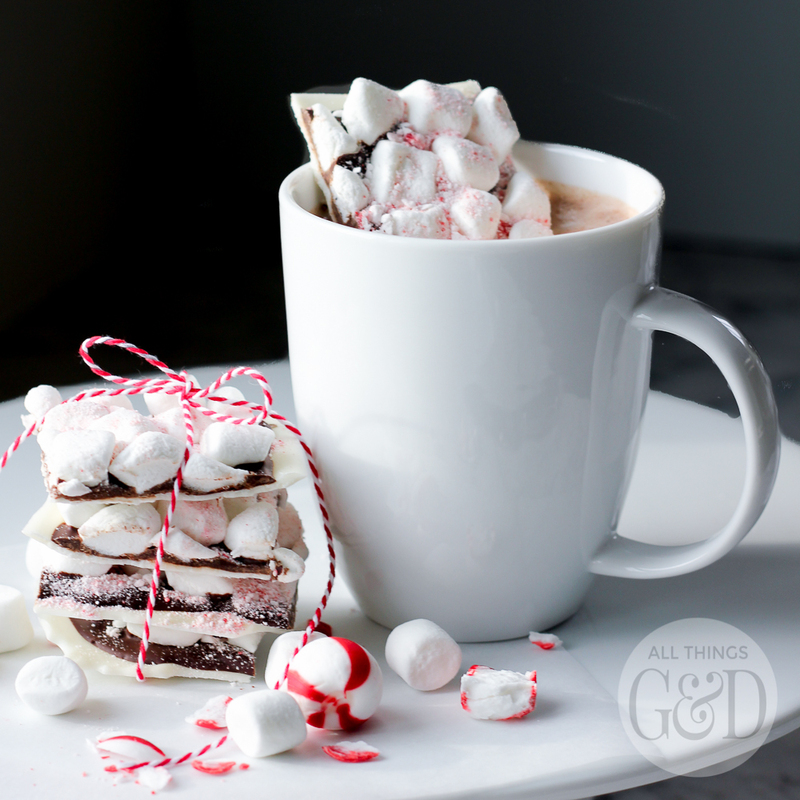 The chocolate and peppermints melt within seconds, the little marshmallows bounce to the top, and soon you’ll be sipping on the best cup of cocoa you’ve ever had! Be sure to purchase SOFT peppermint candies (they may also be labeled as “puff peppermints”). The hard peppermint candies (or crushed candy canes) will not melt instantly in the hot cocoa like soft peppermints will. If you cannot find puff peppermints you can give the hard ones a whirl, just be sure to crush them really fine (a food processor works great for this) and know you may get bits of them as you drink. OR you can omit the crushed peppermints entirely and stir 1-2 extra drops of Young Living Peppermint essential oil to the melted chocolate in steps 2 & 5 above. I am only familiar with the Young Living brand of essential oil, so that is the only kind of essential oil I would recommend using for this recipe. Young Living has a “seed to seal guarantee” which means they are guaranteed to be undiluted, free of synthetic chemicals and 100% pure. Young Living’s Peppermint essential oil is also labeled as a dietary supplement which means it is safe to ingest. Please do not buy any old peppermint essential oil off the shelf to use for this recipe. You must be certain that it is safe to eat. 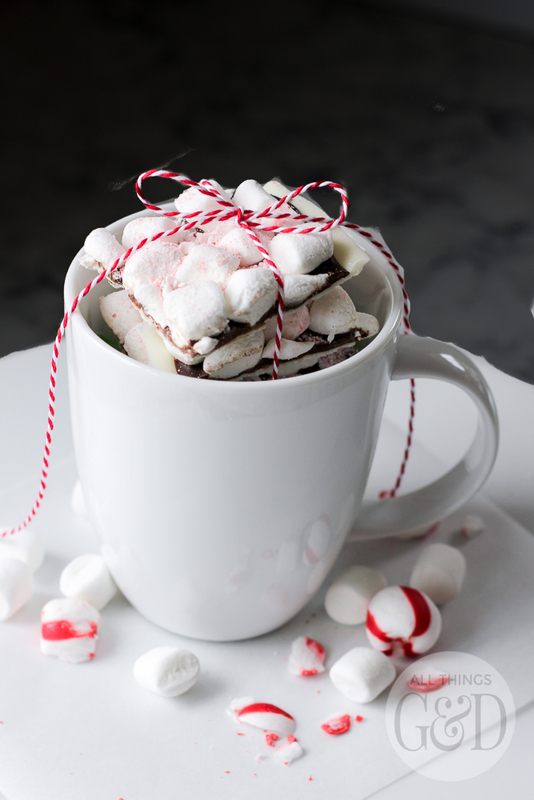 In addition to being a yummy addition to your hot cocoa bar, this Peppermint Chocolate Hot Cocoa Mix-In also makes a wonderful gift! Wrap a few squares up in cellophane and share it with your co-workers, school staff, neighbors and friends. Gift it with a coffee mug, a canister of hot cocoa, a gift card to your favorite coffee shop – or all on its own! Like this idea? 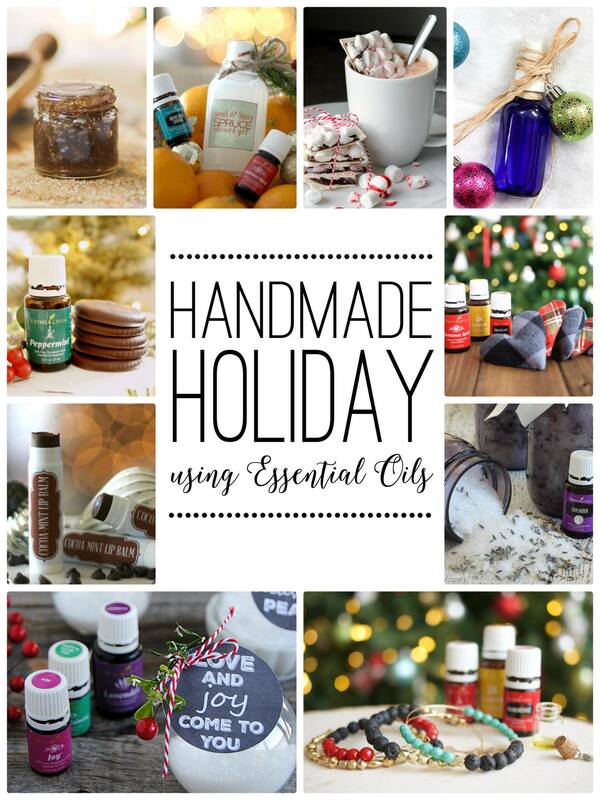 Some of my fellow essential oil-loving blog friends and I are having a Facebook party tonight at 8:00pm CST featuring even more handmade gifts you can make this holiday season using essential oils. Click on the graphic below to RSVP and join us! Sign up as a Retail Customer (it’s free!) 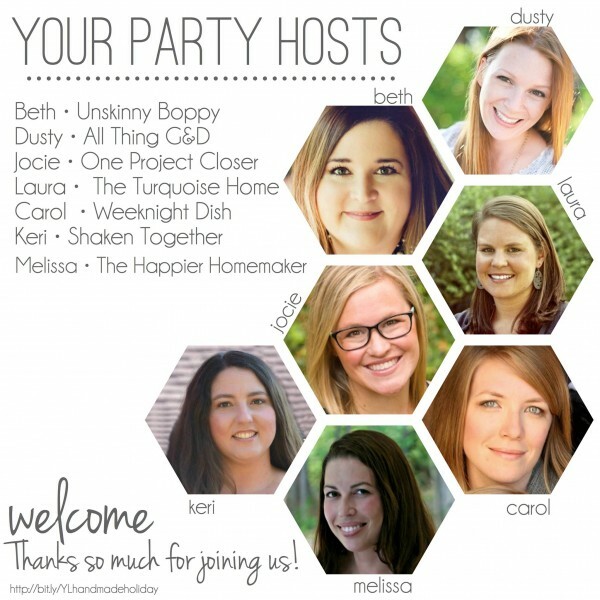 to shop Young Living and pay retail prices. Sign up as a Wholesale Member (which requires the purchase of a starter kit; prices and products included vary) and receive products at a 24% discount. Please explore Young Living using my referral links above and I will receive a credit for your purchase at no additional charge to you. Thank you! I hope you give it a try Donna – it’s so delicious! I can’t wait to try this! Now that the craziness of the holidays is almost over, I’ll have more time. Looks yum! Can’t wait to see/hear how the new house is coming along!!! Thank you so much, Ashley! If you give it a try you’ll have to let me know what you think. We’re obsessed with it here!